The Lombard 6 modern fit pyjama set features a geometric repeat pattern of our rose logo subtly woven into the silky soft fabric. 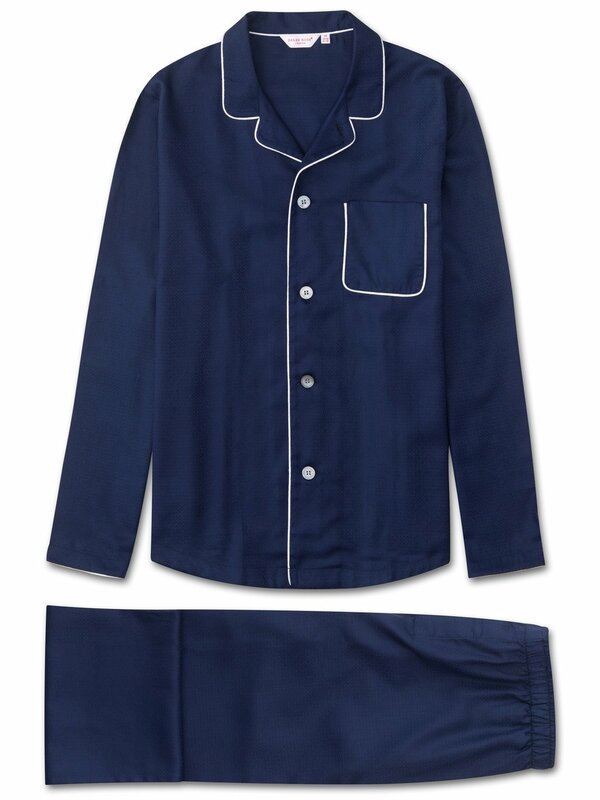 Often mistaken for silk, our Lombard fabrics are a dream to sleep and lounge in throughout the year. Like all our modern fit styles, the navy Lombard 6 is designed for a slimmer and more contemporary cut; one that is closer to the body without being restricting. Made from a medium-weight cotton jacquard, a fabric that excels in both cold and warm climates, the jacket features a sartorially-inspired curved collar, mother of pearl buttons throughout and a piped breast pocket. Furthermore, the rest of the jacket is piped throughout with a complementary white piping.